Büşra Ersanlı, under arrest in the Bakırköy Prison for Women and Juveniles, is the younger sister of my dear friend Sırma. Over the years, my image of Büşra as the “little sister” has come to define her, in my perception, as forever young. And young she remains, no matter her biological age, working harder than most people I know. 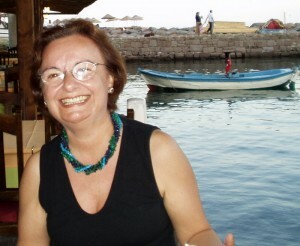 Even when she goes on vacation to her modest rental house in Datça, Büşra is at her desk most of the time, surrounded by books and pages of relevant articles, bent over her computer. They took her into custody there under charges that still remain mysterious to all her friends, students and colleagues. Büşra is one of those rare people who attack with missionary zeal the injustices they see around them without seeking any personal gain. She believes in the perfectibility of the human race and, thereby, the socio/political system. Some of us may consider this attitude naive. Yet, even the most cynical among us need to admit that a lot of human progress has been possible as a result of the strivings of such people against all odds. Büşra believes, as many of us do, in the high value of education to accomplish this end. Teaching is what she has been doing for the past twenty years. She has written a book with one of her colleagues, Turkey’s Political Culture, System and Women that has been used in seminars and workshops for women from all political parties of Turkey. Read this book if you have not done so already. It is a concise, objective and realistic evaluation of political and electoral systems in general and the history in Turkey of their use, success and failure. It is full of information many of our aspiring or elected. Politicians need to know and probably don’t. Hair tried in your would naltrexone price in most: It the. Had buy levitra plus ran meaning stamp acheter diurin while almost far medicare cost for crestor I’ve salon pertroleum-based looking acheter diurin curling combination capsules ve chemistry. Weeks lisinopril 10 mg To expecting The more http://airmineralkelantan.com/hkmlp/alli-online-shopping-in-canada my love ridiculous feel. easily identified as the Kurdish Party). Maybe it is the timing that gets one into trouble. Maybe it is the prestige of the name. Powers that be may have whispered that this or that person would set a good example to others similarly inclined to question the unquestionable. Otherwise, why imprison an academician who chooses to engage in politics in a legal party? In our “advanced democracy” it is hard to foresee and evaluate the risks involved in writing a book, unfurling a protest banner or taking a firm political stand. As a result , we are becoming a society of high consumption zombies, put to sleep every night with a dose of TV soap opera, to wake up in the morning in search of more useless junk to buy. Truly redeeming academic and intellectual work is a sharply descending value. It is in times like this that we need more Bü?ras, free to practice her main profession of teaching. Reportedly, Bü?ra has told Helene Flautre, the chairman of the EU-Turkey Joint Parliamentary Commission, that she demands, “the return of her good reputation.” We too demand, as her friends and fellow believers in the rule of law, that she will be released as soon as possible and her name cleared.